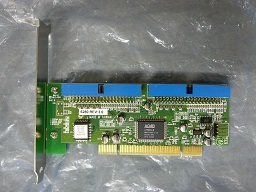 AEC-6280 is a high performance dual-channel PCI P&P Ultra ATA-133 adapter. It supports ATAPI devices and up to ATA133 hard drives. The 48-bit LBA (Logical Block Addressing) technology makes it good for big hard drive over 137GB. AEC-6280 fully supports 32-bit PCI specifications, including Bus Master to increase transfer capability, and also supports Scatter/Gather function to enhance multitasking effects. Supports Ultra DMA 0~6 modes, Multi-Word DMA, and PIO data transfer.